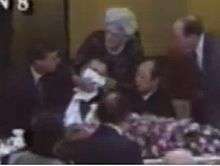 Frame from an ABC News video of First Lady Barbara Bush holding a napkin in front of President George H. W. Bush's face as he vomits. 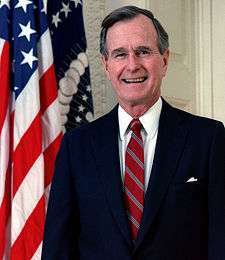 On January 8, 1992, about 8:20 p.m JST, U.S. President George H. W. Bush fainted after vomiting at a banquet hosted by the then Prime Minister of Japan, Kiichi Miyazawa. It is the only documented occurrence to date of a U.S. President vomiting on a foreign dignitary. On January 8, 1992, Bush was attending a state event for 135 diplomats held at the home of the Japanese Prime Minister, near the end of the President's 12-day trade-oriented trip through Asia. Earlier that day Bush had played a doubles tennis match in which the Emperor of Japan Akihito and his son the Crown Prince Naruhito beat Bush and his partner, a former U.S. ambassador to Japan. The incident was widely reported, and quickly became fodder for the nation's comedians. Footage of the President vomiting was broadcast on the ABC network. Shortly after the incident, an Idaho man, James Edward Smith, called CNN posing as the president's physician and claimed that Bush had died. A CNN employee entered the information into a centralized computer used by both CNN and sister network CNN Headline News, and Headline News nearly aired it before it could be verified. Smith was subsequently questioned by the Secret Service and hospitalized at a private medical facility for evaluation. In Japan, even several years later, Bush was remembered for this event. According to the Encyclopedia of political communication, "The incident caused a wave of late night television jokes and ridicule in the international community, even coining Bushu-suru which literally means 'to do the Bush thing'." According to USA Today, the incident was one of the top "25 memorable public meltdowns that had us talking and laughing or cringing over the past quarter-century." Saturday Night Live presented a parody skit of the incident in the form of an Oliver Stone conspiracy movie. In the "Two Bad Neighbors" episode of The Simpsons, Bush tells Homer Simpson that he will "ruin [him] like a Japanese banquet!" In his 1993 Golden Globes acceptance speech as Best Actor in Comedy or Musical, Robin Williams impersonated Bush during the incident. In the pilot episode of King of the Hill, Hank Hill says "Detroit hasn't felt any real pride since George Bush went to Japan and vomited on their auto-executives." The 1993 film Hot Shots! Part Deux also lampooned the incident. In the 1996 film High School High Teacher Richard Clark (Jon Lovitz) asks his class who was the first President to blow chunks at a Japanese Head of State. ↑ Wines, Michael (January 9, 1992). "Bush Collapses at State Dinner With the Japanese". New York Times. Retrieved 2009-08-28. President Bush fell suddenly ill and collapsed at a state dinner being given for him Wednesday night at the home of the Japanese Prime Minister. ↑ McDougal, Dennis (1992-01-10). "CNN Averts Hoax About Bush's 'Death'". Los Angeles Times. ↑ Peter McKillop, "Letter from Japan: Back to the Future: Will George W. Bush carry on his father's (barfing) legacy?, Time Asia found at Time Asia archives. Accessed September 19, 2009. ↑ Lynda Lee Kaid and Christina Holtz-Bacha, Encyclopedia of Political Communication, Volume 1, p. 72, (SAGE, 2008), ISBN 978-1-4129-1799-5, found at Google Books. Accessed September 19, 2009. ↑ "They did what, said what?". USA Today. May 7, 2007. ↑ "Bad Sushi". YouTube. 2006-07-23. Retrieved 2014-05-12. ↑ "Youtube Hot Shot Part Deux - Trailer". Youtube.com. 2013-06-18. Retrieved 2014-05-12.